At first glance, the square on the right actually looks like a transparent film of some sort, but you will be surprised to know that it is actually a battery. I know I was surprised myself, but what we see is actually a polymer based rechargeable battery developed by Japanese scientists from the Waseda University. This unique battery is made from a 200 nanometre thick (or should the right word be thin?) redox-active organic polymer film that come with nitroxide radical groups attached to it. These nitroxide radical groups act as charge carriers, offering a high charge/discharge capacity thanks to the high radical density. Other than this advantage over regular batteries, it was interesting to note that the power rate performance is nothing short of jaw dropping – it takes a mere minute to charge the battery fully and boasts a superior cycle life of over a thousand cycles. This mechanically tough polymer overcomes the drawback of using organic radical polymers by a solution-processable method that is crosslinked thanks to a bisazide crosslinking agent after going through a bout of UV irradiation. Apparently, this upcoming battery is so impressive that Professor Peter Skabara from University of Strathclyde has praised the high stability and fabrication strategy of the polymer-based battery. I wonder when will these batteries be available commercially to the consumer market. Imagine charging our devices within one minute and heading out of the door on a full charge, something we only dream about these days. If this battery ever becomes reasonably cheap to produce; it will help enormously with the storage of sun/wind energy. 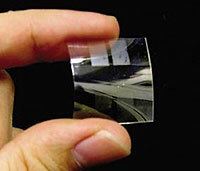 Batteries could be made in unobtrusive shapes. No need for a battery room in your solar home. Architects will love this. And, I assume, large amounts electricity could be stored in smaller lighter units. Since it charges very fast, a wind generator system would be able to absorb the “excess” electricity generated by a wind surge. Instead of having the windmill forcibly reduce the rotation of the blades. Battery size, weight, and charge times are important issues with electric cars. Problems solved. Since I know very little about this new technology all of the above could be “battery in the sky” dreaming. It will still be interesting to see how this thing evolves into new applications. I can’t believe I’m the only one who has ideas/opinions about this. Don’t worry. You are not the only one who is thinking about it. They wouldn’t invent this type of battery if they wouldn’t know possibilities that it would bring. This is a hoax! The presented picture is the transparent substrate they are using, not the battery itself which is opaque at the end! In their original paper (Takeo Suga, Hiroaki Konishi and Hiroyuki Nishide, Chem. Commun., 2007, 1730–1732), pictures have been messed-up. Note that these researchers never claimed about transparency since targeted application is paper battery (which is also kinda cool). So what are the applications? What does it mean for your average SME?